Boss has unveiled an intriguing new pedalboard solution with the MS-3 Multi Effects Switcher, which pairs MIDI and loop switching with multi-FX. Boasting GT- series-worthy effects (112 of them, to be precise), the MS-3 can run up to six internal effects at once, while integrating three external pedals. In addition, it can switch amp channels, adjust effects in real time and integrate with MIDI devices - both manual and memory modes are on offer, and settings can be stored in 200 patch locations. As you'd expect, there's a huge amount of connectivity round the back, from external footswitches for tap tempo, effects on/off and parameter adjustment, plus expression pedals, control out jacks, and USB for accessing the free MS-3 Editor/Librarian on Mac/PC. 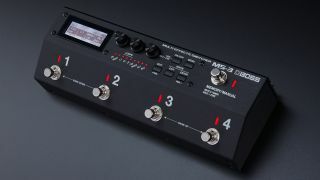 The MS-3 is available soon for £439/$559 - see Boss for more info.